Being vegan really can be as easy as pie. Our Head Pie-oneers, Jon & Tris, have whipped up a yummy vegan pie recipe that you can try at home. This is a seriously scrumptious, must-have dish that goes down a treat with meat-eaters too. Heat the olive oil in a frying pan, add the onions and cook for 3–4 minutes, until softened. Add the garlic and courgettes and cook until the vegetables are just tender and lightly coloured. Stir in the chilli, rosemary, and thyme. Remove from the heat and stir in the chickpeas, cherry tomatoes, balsamic vinegar, and extra virgin olive oil. Transfer the mixture to an ovenproof dish. Heat the oven to 160°C/320°F/gas mark 3. Lay out a sheet of filo pastry on a work surface and brush with olive oil, then scrunch it up loosely so it looks like a rose. Drop it on top of the filling and repeat with the remaining filo to cover the dish. Cover with foil and bake for 15 minutes or until the filling is thoroughly heated through. Remove the foil and bake for about 5 minutes longer, until the pastry is golden. Fancy something on the side? 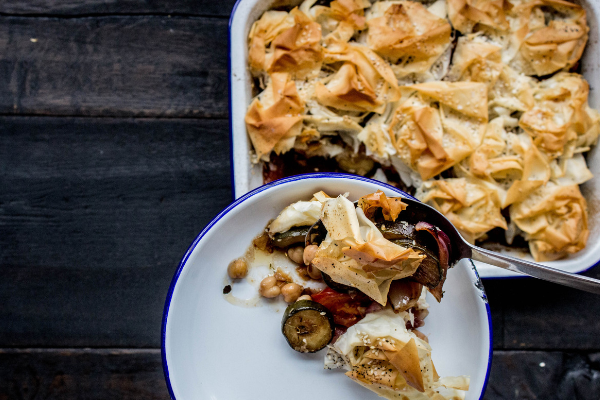 This pie tastes great with asparagus and a dollop of houmous. Not quite ready to try your hand at cooking pies? We’ve got two vegan pies, Kevin and Chooks Away that simply need popping in the oven – all the flavour without the effort!